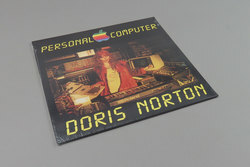 Doris Norton - Personal Computer. Vinyl LP. Bleep. First in a three-part wave of retroactive synth-pop reissues of avantgarde Italian-born producer Doris Norton. While it seems that there is an endless stream of "lost synth pioneer" etc. etc. reissues each week, when a label like Mannequin promises to deliver gold you can bet your bottom dollar that they will come through with the goods. On Personal Computer they have done just that. This is the sound of an artist well educated in the discographies of Yellow Magic Orchestra and Kraftwerk, yet it’s an artist who is also totally punk. We’d say start with the you-have-to-hear-it-to-believe-it proto-DNB roll of Caution Radiation, while the zoviet:france dub disco of ADA Converter is sure to cause an excited uproar from those who are plugged in. Personal Computer is every bit as wonderful as its sleeve would have you hope/imagine.